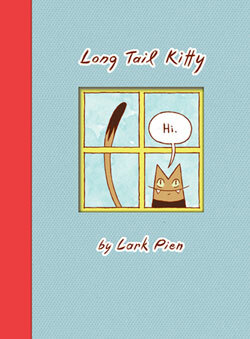 In my opinion, every bookshelf should have a long tail kitty, or at least a copy of Lark Pien’s lovely book by the same name. “Long Tail Kitty” is fantastic – I cannot get enough of this fabulous little book. Not only are the illustrations right up my alley (Pien is a long-time graphic-novelist and her drawings are simple and poignant and utterly adorable) , but the small chapter format is great for little readers. Long Tail Kitty meets aliens, talks to a crabby bee and ultimately steals your heart.